Berlin is well equipped with a tight grid of public transport lines, operating long hours. Wherever you are – chances are that the next Bus Stop or U-Bahn Station or the like is not far from your current location, ready to take you to your next destination. Berlin public transport is also rather affordable and the stations and vehicles are in rather good shape. But of course there are also some exceptions. In the city center area many public transport lines are available during night times and – of course – on the weekends. But finding the right connection can sometimes be tricky. In the past years the two operators BVG and S-Bahn (Deutsche Bahn) have been constantly working on improvements – even though the public opinion may sometimes differ from that. To get from ‘A’ to ‘B’ you may have to switch between different means of transportation – and Berlin has quite a variety to offer. Probably the two easiest to use are S-Bahn (“Schnellbahn”) and U-Bahn (Subway / Metro / Tube). 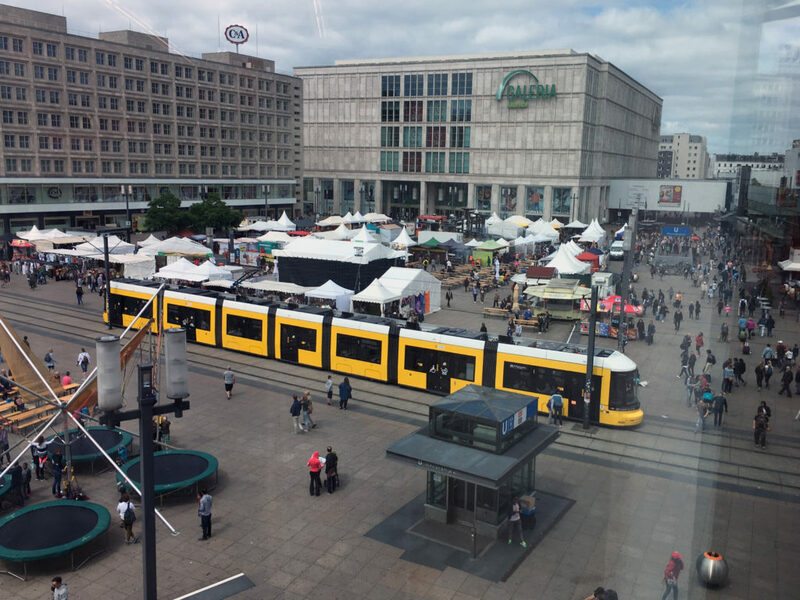 But then there is also a fleet of buses (mostly in West-Berlin) and Trams (mostly in East-Berlin) and additionally you may also take a ferry ride to get to the destination of your choice. To buy a tickets you can choose from quite a great variety of different options. You can either buy a ticket directly in the bus from the conductor or in the tram from a ticket vending machine, buy it from a kiosk or one of the official BVG ticket counters. You can buy tickets online or through the BVG App or even pre-order your monthly tickets through an annual subscription (Abo/Abonnement). The choice is yours. The word S-Bahn is short for “Schnellbahn” – so the “S” actually suggests that is is a fast train. And compared to the other public transport options it is probably the fastest. The S-Bahn mostly operates above ground and you can either recognize it by the red-and-beige cars or by the white “S” in a green circle. The word U-Bahn is short for “Untergrundbahn” – so the “U” actually suggests that the trains would mostly operate underground. There are however some lines that do operate above ground – for example U2 in Prenzlauer Berg / Pankow and the popular U1 in Kreuzberg / Friedrichshain. Some of Berlin’s more residential areas may be well connected by U-Bahn, S-Bahn or even Tram Lines – but some are not. And those areas rely on BVG’s well equipped bus fleet. A coupleof years ago Berlin’s public transport operator decided to add another ‘means of transportation’ to the Berlin mix: The “M Lines” or “Metro Lines”. Both Tram Lines and Bus Lines can be Metro Lines – and this can be a bit confusing. You’re probably wondering what the difference between an M-Tram and a regular Tram is? Well – as far as I know, the only difference is, that the M-Lines operate more often, than the regular Tram and Bus Lines.